Have you ever felt being poked by an unwelcome guest? Especially if the guest makes your skin crawl. Well if the guest creeps you out that much then he is no longer a welcomed guest. In fact, he is a nuisance in your life. Here, friends, we are not talking about annoying nosy people but rather little antsy ants that often take up residence at your home. Ironically, these ants believe it is their right to camp out in your kitchen as it is the source of the ultimate supply of food. So, naturally, you want to know about ant traps. Check out a video to see how people naturally get rid of ants. Ants do not like the smell of cinnamon which works out just great for you. You can place cinnamon sticks where ever you see ants. Also, you can sprinkle cinnamon on the spots mostly acquired by the ants. The smell will make the ants repel and disconnect from its path. As for cracks or crevices from where ants enter, you can coat it with cotton dipped in cinnamon oil to prevent ants from entering through it. Lemon is another easy to use and safe option to get rid of ants. The acidity and smell of lemons destroy the path of ants. It also helps in preventing the formation of new ants’ paths. You can pour drops of lemon in the cracks or holes that ants use to enter your kitchen. But the important thing is you should not only pour lemon in the cracks but also wipe the whole area with lemon juice to eliminate wandering ants. To make effective use of ants you have required the repeat the process a number of times. The strong smell of vinegar is great to drive away the ants. make a mixture consisting of an equal amount of water and vinegar. Pour it into a spray bottle. Use it to spray on regular spots of the ants and their paths. As vinegar spray is safe you can easily use it on countertops, floor, and cabinets. In fact, it is a win-win situation for you as vinegar spray not only kills the insects but also acts a cleaning agent. Salt is another at home ingredient that does a marvelous job of repelling ants. You can make a salt spray by mixing it in salt water. Use the spray whenever need feeling be. Like any other above-mentioned remedy just spray the mixture over the cracks and area where ants most likely crawl. Or to save time you could just sprinkle some salt on the affected area. Mint and herbs have a great smell. Almost everyone loves it but fortunately not ants. You can play this fact in your favor. Confused? Well simply put, place your herb plants near doors or windows to gross out the ants and prevent them from entering your kitchen. To make it more effective, you can place herb leaves in cracks and crevices. Besides mint, ants also loathe the smell of lavender, thyme, and basil. Garlic is great ant repellent too but some people do not like their kitchen smelling like garlic so you might want to think twice before you use it. To keep ants from making their way in your kitchen you should use a chalk to draw a line around your kitchen’s entry points. The calcium carbonate in chalk repels the ants as it is made from the ground up and crushed shells of marine animals. Instead of drawing lines, you can crush the chalk to make its powder and sprinkle it over the ants crawling spots. Cornmeal is actually one thing mentioned in this list that attracts ants rather than repels. So what makes it a good choice for getting rid of ants? The fact that ants are attracted by cornmeal is very useful. Because although ants eat cornmeal they can never digest it which proves to be fatal for the ants. So you can place the cornmeal at the places that ants use to enter your kitchen. This method is really effective but the downside is that it may take days to completely eliminate ants. You can also use dried rice and wheat flour in a similar way. 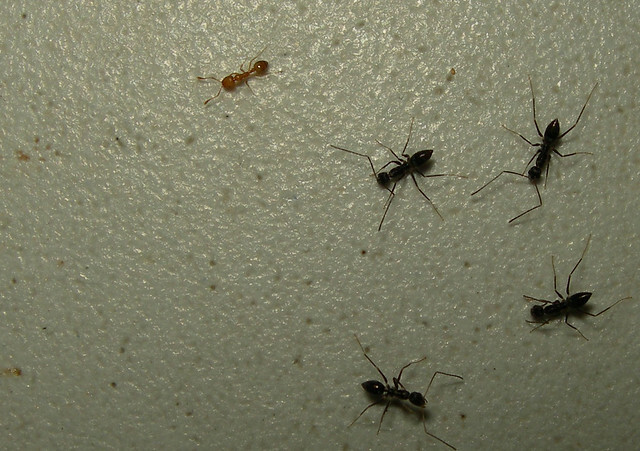 Why Ants Camp Out In Your Kitchen? You know the kitchen is the den of food to lure any ant to come out from its hide and feast. But what if you clean your kitchen daily and scrub away the dirt from every corner? Is It Enough To Keep The Ants Away? Guess not. Because even if you wipe out every corner of your kitchen there might be a slight chance that you might find an ant lurking in the dark corners. Well, that’s easy! You come up with the best ant traps. Yeah, ant traps they will definitely keep the ants at bay. Have you ever noticed that ants not only feast on food but also bring back the food to their nest? Ants form a path to and from the food source which is really disgusting. Whenever you see an ant in your kitchen your natural instinct is to spray a toxic chemical that not only helps to get rid of ants but also contaminate your food. But the good news is there are some safe homemade traps that are really helpful in riding the ants out of your kitchen. So these are some of the natural, safe and easy to apply ways that you can use to drive ants away from your kitchen. The plus point of using these methods is that they are cost-effective. Usually, every household has the things like cinnamon, lemon, vinegar, salt, and mint. Also, these methods are not hazardous to your health. Any of these methods is way better than using the harmful chemicals. Simply put, these methods ensure that ant trap is healthy and cost-effective means. Thefinestkitchen.com is a participant in the Amazon Services LLC Associates Program, and we get a commission from advertisement and purchases made through links displayed on this site.